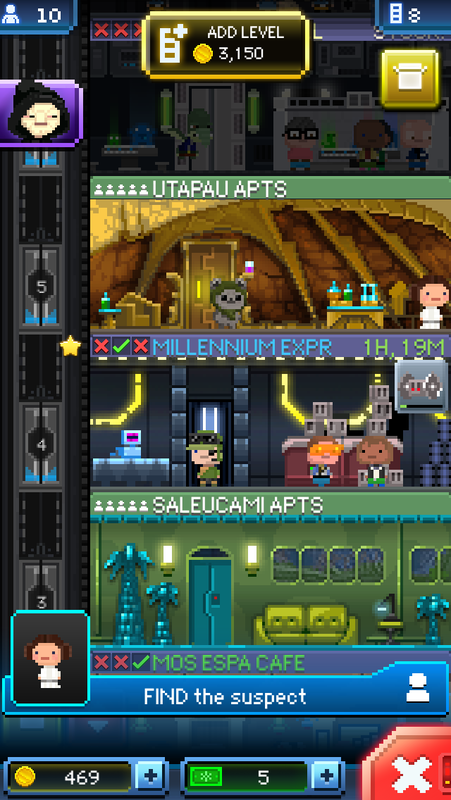 Bitizens are required to run the various shops you will be building in the Death Star. They will specialize in either of these four categories: Retail, Recreation, Food, and Service. They have a rating from 0-9, 9 being the best. They also have a “dream job” they would like to be hired for which nets you a nice Imperial Buck and doubles the amount of products your bitizens sell, so pay attention! The ratings determine on how fast a bitizen will stock products in your level, so the higher the better obviously. There are also VIPs who provide various specialties to help you along your way. You can even save the VIPs for later use. The last group of characters you’ll be transporting are the ? characters, which are the various recognizable Star Wars characters, if transported to a specific level will open a short “movie” scene. They also provide you with more tip than the ordinary bitizens do. There are small little side jobs to perform for the Emperor as well. He will have jobs such as building more levels or looking for Rebel Spies and you gain more coin for completing these objectives. Dart Vader has some objectives as well that pay off much more, but you need specific Imperial levels and Supply Officers to reach the necessary goals. Searching for specific Bitizens or Rebel Spies earn you Imperial Bucks, besides building a new level these are the only way of gaining those precious Imperial Bucks without spending your hard-earned cash. Thankfully, LucasArts provided players to complete the game and gain Imperial Bucks without those silly micro-transactions getting in the way. Before LucasArts disbanded, they gave us one last Star Wars hurrah on the mobile. And I must say they did a great job. The graphics are absolutely 8-bit retro cute. Seeing all the original and unfortunately new characters in 8-bit-style is awesome. Nothing less can be said. The aesthetics is what kept me into the game. Watching the Star Wars universe unfold like the way Tiny Death Star did is going to make it hard for me to see Star Wars the way it is now (unless it’s Episodes I-III, then I’ll just skip over those). The music is greatly done. The sound team took all the original score and made it into elevator music, which was very creatively done. The 8-bit retro mobile game is an addicting way of spending time. Micro-managing your various business and taking care of your “bitizens” to build your Death Star to Empire standards. It does get very time-consuming. As in, you will be waiting for the time to “create” levels, products, and other materials to be produced. Once you start building past a total of 20 levels or so, the time to wait for the next creation goes up to 6 hours and going to levels beyond 60 can make you wait for more than a day. A DAY! This is where I am going to criticize the most about the game. The wait time will make most players forget about this game. I understand it’s to lengthen the game or some other reason, but the wait time gets ridiculously long and the time to build more levels will take you days to continue. Even the products your waiting to stock can take up to 12 hours! The sound is also something they need to fix. It gets repetitive fast. The same music and sounds will constantly bombard your ears. Thankfully, you don’t need sound to play the game. The last complaint is finding bitizens for Imperial Bucks. It’s great to gain Imperial Bucks, but the bitizens sometime go off screen and searching for those little bastards when you have 30+ levels get quite annoying. The game is addicting at first; wanting to get as much coin and Imperial bucks as much as you can. But Tiny Death Star may fail at keeping the gamer coming back. For a mobile game it will tickle your fancy for a short while, but after you hit the wall of waiting over half a day, heck even shorter than that, that will push away many gamers and Star War fanatics. I technically finished the game. I mean technically, because I got everything Tiny Death Star has to offer, but you can keep playing for fun even after all the time you wasted… There will be more updates coming, but until they add a huge amount of content…I’ll be moving on to other games. It’s a great homage to the Star Wars universe, but sadly most will not play long enough to see all of it. Update: There have been updates for the past two weeks. I doubt they listened to me, but it’s nice to know the developers are trying to update the game every week. I don’t know how if the updates will be consistent or it will be weekly for X amount of time. I have picked it up again, but not as often as I once did. There are level bugs in creating levels however. I mean I can’t get some of the levels I want and it randomly gave me two different levels from what I have chosen…hopefully that is fixed. The review score will still stay the same.